The National Revival is a period when Bulgarians gathered spiritual and intellectual strength to establish their right of independent political and social existence, and their own culture and education. Outstanding figures of the Bulgarian National Revival, most of them educated abroad, gradually arrived at the idea of opening a school of higher education, which “would make Bulgarians equal with other politically independent, socially organized and culturally emancipated nations”. Bulgaria’s native culture is rich and ancient, but at one time, it seemed in danger of being lost forever. Bulgaria was under the rule of the Ottoman Empire for almost five centuries, and the Empire’s Turkish authorities suppressed any expression of unity or national pride by the Bulgarian people. Bulgaria had poor schools and no other institutions in place to protect and preserve its heritage. Under such conditions, the country’s traditional culture could not thrive. That situation underwent a dramatic reversal during the period known as the Bulgarian National Revival. This cultural renaissance began in the 18th century and is divided into three stages: the early period, including the 18th century and the early part of the 19th century; the middle period, lasting from roughly the 1820s until the Crimean War, which ended in 1856; and the late period, dating from the Crimean War until Bulgaria’s liberation from the Ottoman Empire in 1878, as a result of the Russo-Turkish War. During the Revival, a number of well-educated Bulgarians made a conscious effort to awaken feelings of pride and unity among their countrymen, in part because they felt that such feelings were necessary if Bulgaria were ever to regain its freedom from Ottoman rule. They did this by working to develop Bulgarian literature that would call to mind past glories and hopes for a better future. They worked to establish modern schools, and within a few decades, 1,500 primary schools were in operation throughout the country. This, in turn, allowed more young Bulgarians to further their educations at the great universities of Europe and Russia. Within a short while, the country had a well-educated elite, which took control of the arts and newspapers in Bulgaria. National pride and unity were greatly reinforced by these efforts, which are credited with paving the way to successful opposition to Ottoman rule. On November 1, Bulgaria celebrates a national holiday to honor and remember those visionaries who did so much to establish a sense of national pride and to lay the foundation for Bulgarian liberation. The holiday was declared official in 1922, but was suspended in 1945 after Bulgaria came under Communist rule, as part of the former Soviet Union. After the dissolution of the Soviet Union, celebration was resumed in 1990 and made official again in 1995. Across Bulgaria, Leaders of the Bulgarian National Revival Day (sometimes called National Enlighteners Day ) is an occasion to pay tribute to all those committed to culture and education. It is traditionally a day to give awards to outstanding teachers, actors, and artists of all sorts. Since the 1930s, it has been a tradition in cities and towns throughout the country to hold parades honoring students and teachers. In the capital city of Sofia, the parade progresses beneath huge portraits of those leaders who nourished Bulgaria’s cultural rebirth. Holy Cross Orthodox Monastery will be celebrating 2 special Divine Liturgies in Old Bulgarian (Church Slavic) for our Bulgarian brothers and sisters, and all other Orthodox Christians and their friends, who wish to take part in these Liturgies on Sunday, August 1, 2010 (at 11:30 AM) and Sunday, August 15, 2010 (at 11:30 AM). Dear Bulgarian brothers and sisters, all Orthodox Christians, and everyone who loves God and their neighbor – Come and see! Holy Cross Orthodox Monastery will be celebrating a special Divine Liturgy in Old Bulgarian (Church Slavic) on Sunday, August 1, 2010 in honor of the Procession of the Holy Cross. The Monastery will be celebrating another special Divine Liturgy in Old Bulgarian (Church Slavic) on Sunday, August 15, 2010 in honor of the Dormition of the Most Holy Mother of God. These two Liturgies are being celebrated especially for our Bulgarian brothers and sisters, all other Orthodox Christians, and any of their friends who would like to join us in these services. 11:30 AM – Bulgarian Divine Liturgy will begin in the monastery’s church. These spiritual events are sponsored by the monastic brotherhood of Holy Cross Orthodox Monastery. No formal social event is planned after the Holy Liturgy; i.e., no food or beverages will be sold after Liturgy. But you are welcome to stay after Liturgy and to bring your own food and refreshments to share with your friends and your brothers and sisters in Christ, while you enjoy the beauty of nature here at God’s holy monastery. GERGJOVDEN is a holiday in honor of St. George who is the patron of shepherds and herds. This holiday has a lot of rituals connected to various spheres of Bulgarian life. The typical cattle rituals are interwoven with rituals connected with agriculture, health and wellbeing. In the spring night before the holiday lasses and girls gather flowers and herbs from the fields for the ritual feeding of the sheep and cattle. Three wreaths are made from the flowers: one for the sheep that will be milked first, one for the lamb that will be given as a sacrifice for the saint and one for the bucket with milk in it. The homes and the cattle sheds are decorated with green spring leaves. The shepherds take the herds out for a grazing before sunrise and when they come back a ritual milking is performed. A lamb is slaughtered on Gergjovden as a sacrifice to the patron saint. A big table for the whole village is set on the green fields in front of the churchyard, outside the village or near the cattle sheds. Other ritual meals are put on the table except for the roasted lamb. The Gergjovden bread has a special place on the table. In the Eastern parts of Bulgaria the young girls stand up next to the table so that the hemp goes tall. The Gergjovden sacrifice: The first born male lamb is chosen for that ritual. They put a flower on it, a candle is put on the right horn and it id lit before the slaughtering. In Southern Bulgaria they slaughter the lamb in the garden under a fertile tree and they leave the blood to get soaked in the ground and in Western Bulgaria the slaughtering is done near a river where the blood runs out into the water. It is believed that the blood has protecting powers. They make a blood cross on the children’s forehead to keep the evil eyes away. The bones are gathered and are buried in an anthill after the holiday so that the sheep become as much as the ants or they are thrown away in the river so that the milk start running like water. The whole Gergjovden lamb is roasted and a green spray is put on it. Gergjovden bread: Bogovitsa, kravaj, kolak, a loaf for St. George, Communion Bread, ovcharnik, koshara (cattle shed), baltak, etc. – the preparation takes part the previous day. They are mixed together with new leaven for the sheep to have more milk. The water needed for the kneading of the breads (mulchana (silent) or tsvetana (with flowers) – has flowers and herbs in it) is carried by a young bride. The woman that is kneading the bread is dressed in clean clothes and wears a bunch of flowers tied with a red thread. Church Holiday: The martyr saint George the Conqueror is honored by Christians and Muslims. He was the son of rich Christian parents and he himself becomes a great adherent of Christianity. He was decapitated in 288 during the time of the emperor Diocletian. St. George becomes the patron of wars and the army. Folk legends describe St. George as a man fighting with dragons. Ritual table: roasted lamb, ritual breads, fresh milk, cheese made from that milk, yogurt, a milk and rice desert, garlic, boiled wheat, pastry with butter, pork brawn and eggs. 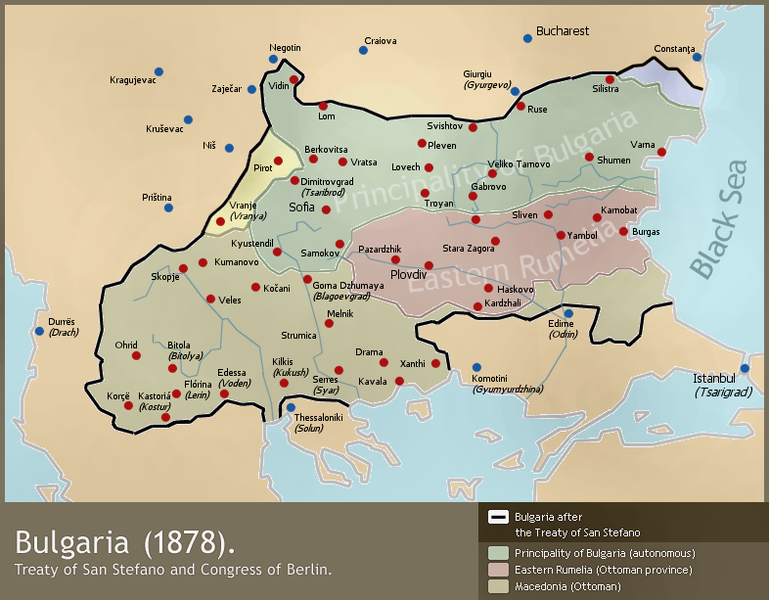 The Russo-Turkish War of 1877–1878 led to the re-establishment of a Bulgarian state as a constitutional monarchy in 1878, with the Treaty of San Stefano marking the birth of the Third Bulgarian State signed on March 3, 1878. The Peace Treaty of San Stefano marks the revival of the Bulgarian State, submerged under Ottoman rule since the end of 14th century. However, the actual live of independent Bulgaria started after the Berlin Congress, which took place a couple of months later in 1878. By tradition on Bulgaria’s national holiday March 3 thousands of people went to the Shipka peak in Stara Planina mountain to honour the memory of Bulgarian volunteers and Russian soldiers, who fought for Bulgaria’s freedom. Throughout the day people of all generations, carrying national flag, were climbing the stairs to the monument, standing on top of the hill. Among the visitors were Bulgarian emigrants, who had come to spend the national day at Shipka peak. On the occasion of Bulgaria’s national day president Georgi Parvanov has received congratulations from Russia’s president Dmitriy Medvedev, the British queen HM Elizabeth II, the Emir of Qatar and from the Pope Benedict XVI. The Bulgarian Orthodox Church honors Sunday, February 1, the Day of Saint Trifon, patron of vine-growers, wine-producers and tavern-keepers. The holiday is widely known in Bulgaria as Trifon Zarezan – from the Bulgarian verb “zarjazvam” meaning to prune vines. Saint Trifon was born in 225 AD in the village of Kossada in Phrygia in Asia Minor. His parents were righteous people, who, from very early age, thought him love and devotion to God. Their efforts soon proved successful because Trifon began accomplishing miracles since childhood. He became famous at the age of 17 when he cured the daughter of the Roman Emperor Gordian. Unfortunately, Gordian was succeeded by Decius, who prosecuted Christians, and in 250 AD Trifon was arrested, tortured and decapitated. In Bulgaria, the day of Saint Trifon was initially celebrated on February 14. Under the Communist regime, the Holiday was largely known as the “Day of the Vine-Grower”. In 1968, when the Bulgarian Orthodox Church introduced the Gregorian calendar, the Church began honoring Saint Trifon on February 1, while February 14 remained the vine-growers’ Day. Many Bulgarians still continue to celebrate Trifon Zarezan on February 14 – one of the very few holidays to be still honored according to the old calendar. In recent years, Trifon Zarezan coincides with Saint Valentine’s Day – a holiday largely unknown in Bulgaria during the Communism, but acquiring greater and greater popularity. Bulgarians celebrate Trifon Zarezan with folkloric rituals in vineyard villages throughout the country. The men set out to prune the vines while the women bake festive bread loaves and prepare roast chicken stuffed with rice. Each vine-grower leaves for the vineyard with the bread and the chicken in a new, colorful woven bag and with a vessel (buklitsa) filled with red wine. Before the pruning begins, men turn to the sun and make the sign of the cross three times. After the first three twigs are cut, they wash them with the red wine, holy water and wood ashes that they had kept since Christmas Eve. At the end of the day, everyone gathers together to eat, drink wine, sing and dance. The man who harvested most grapes in the year is appointed “King”. He and his subjects must traditionally get drunk to ensure a good harvest the following year. There are many different folklore versions of the way this Day is celebrated in different parts of the country as well as many different legends about who Trifon was. However, ethnographers are unanimous that the celebrations are rooted in the ancient Dionysus festivities, celebrating Dionysus – the God of Wine, who was known to have thought people everywhere he went how to grow vines and make wine. The celebrations were accompanied by rampant outdoor games and parties.